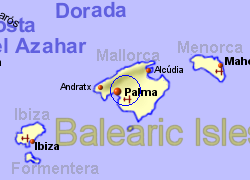 Designed by Jack Nicklaus and built in 1997, the Golf Park Mallorca Puntiró lies approximately 15Km east of central Palma. The course is considered to be of average difficulty and was built retaining as much of the natural vegetation composed of pines, wild olive trees, carob-trees and bushes as possible. Facilities include a golf academy using the Jack Nicklaus teaching method, and covered driving range, putting green, putting green, chipping green, practice bunker, snack bar and restaurant. 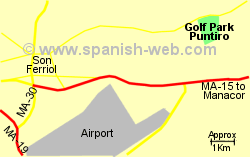 Map of the Golf Park Mallorca Puntiro area.